Since various acids are added to food products to boost flavor, reading the food label may be the best way to determine the acid content yet this information is 99% absent. Usually it is indicated that some acids are present but the concentration of them is not. You can determine those values with some chemistry though! Compound Interest created a cool infographic about the nature and properties of acid contained in foods and drink. Oftentimes, acid-base titration labs are carried out using vinegar as the acid to be titrated. Sometimes this activity is also used to conduct an IA (Internal assessment) for the IB (International Baccalaureate) program. A common activity is to titrate several different vinegars to find the concentration of acetic acid in each brand. The data collected is analyzed and compared. The activity is not that impressive but requires accuracy and the elaboration of data. My colleague, William, and I were thinking about creating an original activity to engage students in a titration lab. Actually, a lot of different acids beside vinegar can be found at home. If the acid is contained in a solid matrix, it is necessary to get the acid out of that matrix in order to obtain a solution which can be quickly titrated. 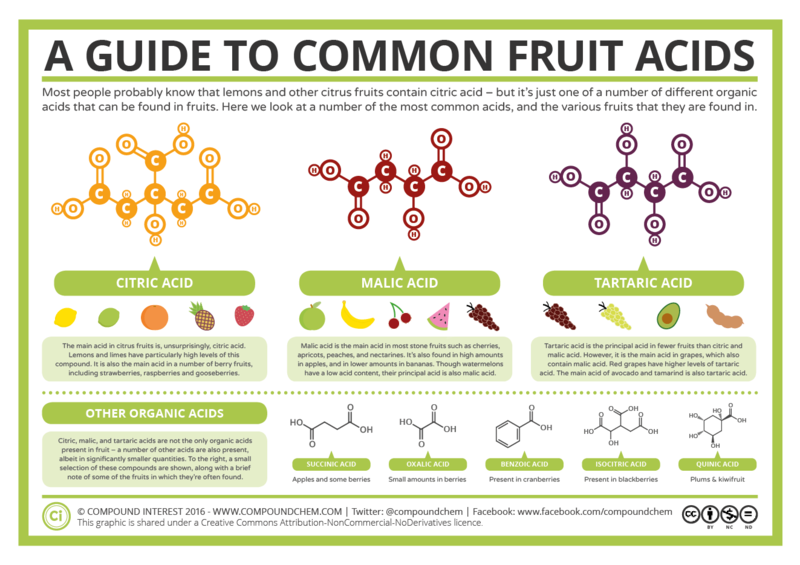 We considered many of those other acids before asking “Why don’t we extract the acid out of candy?” In general, citric acid is used as a preservative in food, drinks and, of course, candy. It is also denoted by E number (code for substances that are permitted to be used as a food additive in the EU) E3303. A more detailed description of this compound is available in the Journal of Chemical Education4 and on PubChem5. In a chemistry lab full of teenage students, it is not difficult to find a pack of candies and most of them contain citric acid! We started out with Mentos Now which we used to illustrate how you can titrate citric acid from candy. 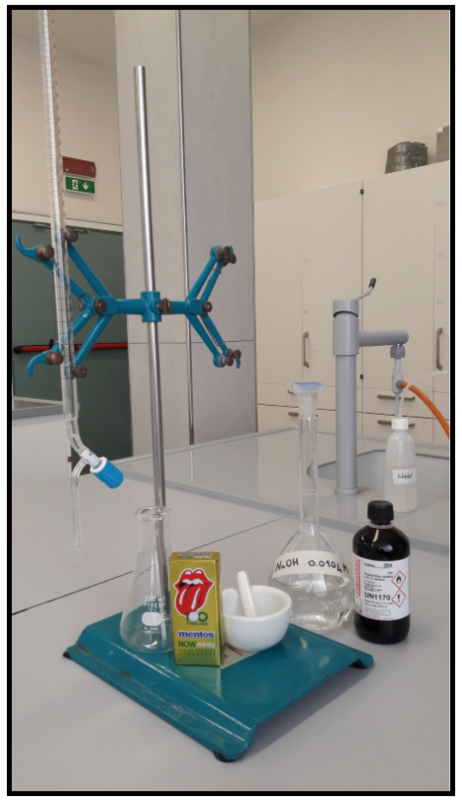 Figure 1 - Equipment used for the titration (dark bottle contains Thymol blue indicator. NOTE: See the Student and Teacher Documents provided below as Supporting Information. One 50 minute class period if the instructor prepares the standardized NaOH. In order to have an adequate amount of citric acid which can also be titrated in a reasonable amount of time, we had to experiment a little bit. We decided that 5 g of Mentos Now tablets was a good option to start with. Candies are crushed in a mortar in order to maximize the possibility to extract the citric acid out of them (Fig. 2). The powder is dissolved in 100 ml of distilled water and the mixture is vigorously stirred for 30 minutes. A standardized solution of 0.01 M sodium hydroxide (made using the classic standardization method: 0.01 M KHP is prepared to determine the exact concentration of the NaOH solution). A 500 ml solution of NaOH is prepared by massing the required amount of base which gives a concentration of 0.01 M. Phenolphthalein is the indicator used to carry out the titration. 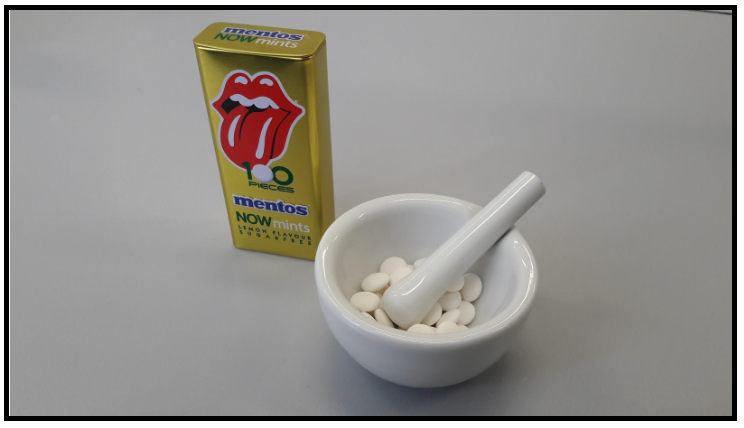 Figure 2 - Mortar and pestle is used to crunch up the Mentos Now candies. Once the solution of NaOH is prepared, it is possible to move on to the filtration of the previously prepared Mentos Now candies. In order to maximize the speed of the filtration step, a vacuum filtration is recommended. Most of the particles are small enough to pass through the filter paper though, so it is a good idea to filter the solution with two filter papers. Filtration is obviously slower but the solution will be less cloudy. The small amount of cloudiness remaining after filtering with two papers is not an issue. The final result is shown in Fig. 3 below (as you can see, solution is not totally transparent). 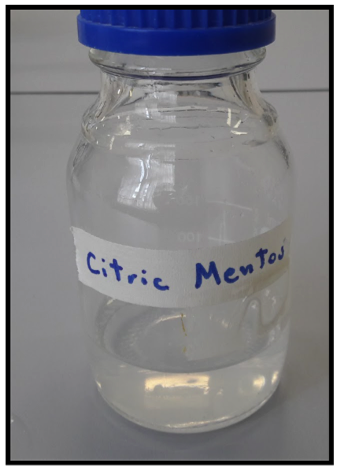 Figure 3 - Solution of Citric Acid from Mentos Now candy. Set up a burette holder on a stand; wash the burette with a small amount of standardized NaOH (at least for 3 times) and you are almost ready to start the titration! Pour 20 ml of the citric acid solution into an Erlenmeyer flask and add a couple of drops of thymol blue indicator. We found out that thymol blue is the best option as an indicator for this activity. (See the teacher handout for more detail.) In fact, when the titration is almost complete the solution turns green and, after, blue which represents the actual endpoint (Fig. 4). 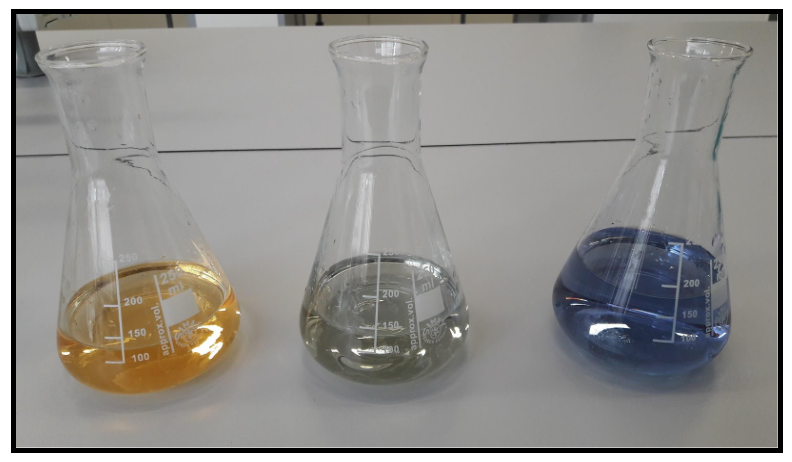 Figure 4 - From left to right thymol blue at the beginning of the titration (yellow), immediately before (green) and at the endpoint (blue). See the "student document" included as supporting information below for complete procedure. The teacher may want to standardize the NaOH instead of having students do it. A standardized solution of 0.01 M sodium hydroxide (made using the classic standardization method: 0.01 M KHP) is prepared to determine the exact concentration of the NaOH solution). A 500 ml solution of NaOH is prepared by massing the required amount of base which gives a concentration of 0.01 M. See the supporting information below for complete procedure.